For the SMS or Game Boy games, see Alien³ or Alien³ (Game Boy). Alien³ is a side-scrolling game released for the SNES in 1993. It is different from the Sega Master System and Game Boy games of the same name. 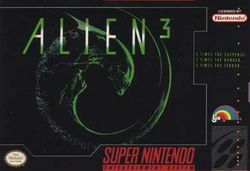 The game consists of six levels loosely based on the events in Alien³. The game also contains elements from the film Aliens such as the adult Alien Queen and military weaponry. This page was last edited on 8 May 2009, at 15:46.